I have been looking at this website for years and never had the nerve to go. My daughter and I just got back from the Sarasota workshop and had a wonderful time. We learned so much in just two days. Jacqueline is an amazing person and teacher. My advice to anyone that is afraid to go, just go! You won't regret it! This workshop was fabulous! Having Jacqueline as a teacher was very inspirational. I have been doing oil painting since I was twelve and have a Masters in Art Education. Although I have taken many art classes in college this was very different. She taught me a different way to look at what I was seeing. It is easy to get set in one way of painting and not want to learn a different way. I enjoyed learning the techniques needed to be a successful Plein Air painter. She gave me the confidence needed to continue making art myself and not just for my students. I recommend taking this workshop even if you know how to paint, but want a fresh perspective. It is a challenge to allow yourself to change the way paint, but it is well worth work. Thank you Jacqueline for this wonderful experience. I had a great time and learned a few things! 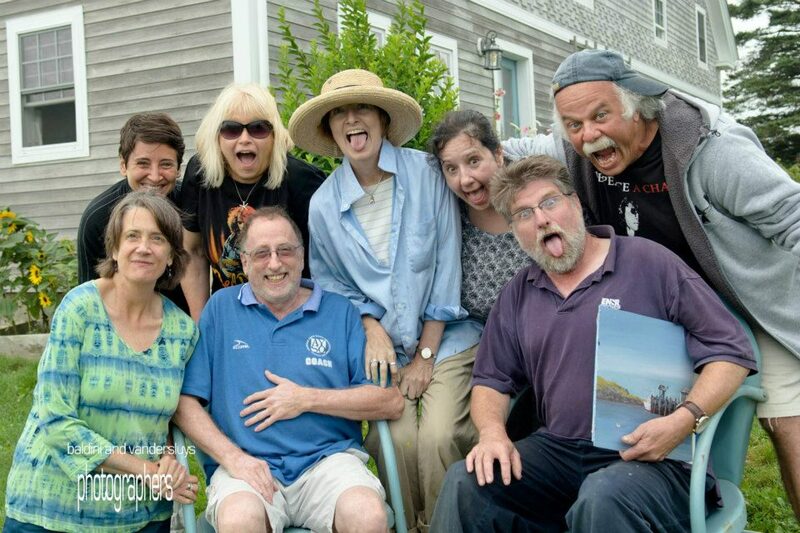 I took your five day oil painting workshop on Monhegan Island. The way you taught us outside by working the tones of the beautiful landscape opened my eyes to be a better painter. thank you, thank you, thank you. You are an absolutely amazing artist, teacher, advisor, confidant and a master of translating the beauty of the soul and of this world onto canvas. You help transform us beginners into wanting to master the art of painting and creating our own stories through this medium. I also really appreciated how you translated the "left brain" technical translation of imagery and helped convert that into "right brain" output. It was really neat. And I thank you for having the wisdom and patience to allow me to work through that - I suspect that I have a lot of conditioning to overcome but I am hopeful that I can start to see light and colour in new ways. So Jack, thanks so much for the best workshop I have ever had in my life. Your gift to me was powerful. I thank you forever. Thank you for the kind words. I had an amazing 2 days. I've learned more from you than all my other workshop instructors together. You had a number a tips or comments that have stuck in my mind all week. If the rain holds off I plan to do a painting tomorrow...just in the backyard. Just back from my recent trip to Buffalo. I have to tell you the the highlight of the trip was painting with you at the workshop. The location was unbelievable, awe-inspiring and indescribable. I'm trying to master phtalo but it really wants to master me. I liked learning your grisalle method of doing a value study. It's a neat technique to add to my arsenal. Most of all, I enjoyed meeting you and will think of you as one of my very talented artist friends. If I can help you advertise your Myrtle Beach workshop, I'd be happy to pass the information onto my plein air group of 60 plus artists. 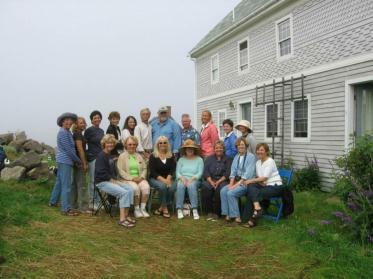 If you need an assistant for your Monhegan workshops in 2010, keep me in mind. I would love to assist if your numbers get overwhelming. Just touched up my paintings from Niagara Falls and will have them on my site soon. Again, thanks for a memorable workshop. I just wanted to thank you again for not canceling the Myrtle Beach workshop. To be able to work with you for two days with your undivided attention was truly a valuable experience for me. Not only did I get information regarding materials, location, set-up, and approach to plein air painting, I received something I wasn't planning on - a direction in my painting! The workshop was worth many times the price of admission! Many more thanks and continued success in your workshops and painting! I had such a wonderful time painting last weekend. I learned so much. You are a patient and giving teacher. Comparing Saturday to Sunday's paintings was a revelation. I look at everything in terms of cast shadows. I also can't wait to send for the Graham paints and try them at home. Thank you so much for the photo of Jeanne and me. We both enjoyed the workshop so much. As my first experience with plein aire painting, I really appreciated the opportunity to watch as you demonstrated establishing a value study and building up the painting with application of color from dark to light. I loved "in the moment" quality of painting outdoors, even when the wind was blowing my easel over! Your input was always helpful and so encouraging. I plan to continue my efforts at painting outdoors and you can count on me being at one of your future workshops. Thank you for an excellent weekend of art instruction. The techniques you taught were great. The entire workshop was very enlightening for me. The methods you taught will bring me to a new level as a painter. I came to the workshop knowing very little about plein air painting, but left feeling inspired to continue with plein air painting. I am also hoping to contact local plein air painters and try to start perhaps a plein air society in our area. Again, thanks for everything...including the trip at the Falls, the Canadian fries and those excellent Maple Leaf cookies. Wishing you many successes ! Kelly Sunderland, PA. I just wanted to drop you a note and let you know what an impact you made on my life. I only took one workshop with you but it certainly was inspiring and educational. I have been able to rededicate myself to painting (even though I still have trouble making time to paint as much as I would like). Not only has my life improved artistically, but also personally. I have met a wonderful man that I plan on marrying soon. Thank you so much, Kelly S.
Hi Jacq: Just a quick note to say how much I enjoyed the workshop. Your workshop has definitely influenced how I think about composition and values. I have been using photos less and doing more from my head, or even combining subjects from photos so they have the effect I’m looking for. I think I’m improving. I’m also trying to make every stroke count. Brenda Hofbauer. encouraged to work at your own pace and find your individual style. It is truly a spiritual retreat. workshop I would like greater emphasis on vino,lobster,cabana boys and cats- Loved it! Hope your Monhegan/Bar Harbor trip is wonderful. I look forward to painting with you again. look. I see a painting. The changing weather is like multiple personalities full of surprise, if not anticipation. 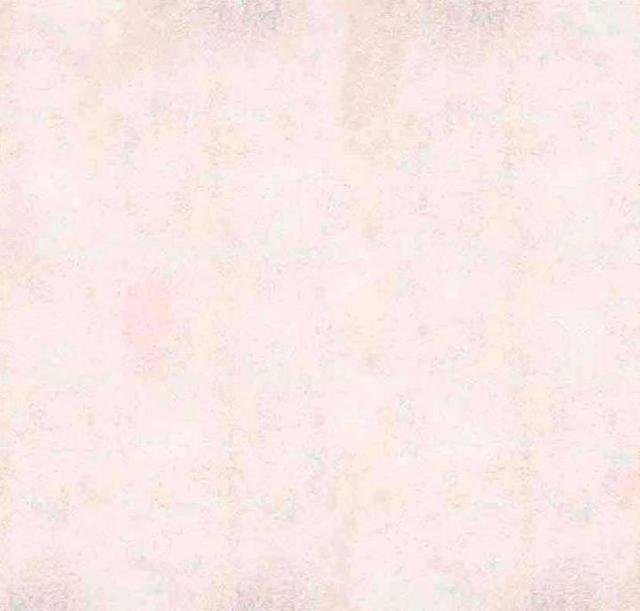 learn to enjoy the unpredictability of watercolor. It certainly matches the aura of the island. I look forward to seeing you and learning more next year. This was the first time on the island for me and I loved it. Everywhere you look there's a painting! air painting. Hope to return next year. Jacqueline taught me to see from a unique perspective and to convey that perspective to others. experience seeing the different styles and techniques that people have used. us to accomplish our goals. The artistic advice and instruction were excellent. Thank You! I feel that I have begun a good foundation for painting with emphasis on value. friendliness of the students and the beauty of Monhegan made for a helpful learning environment. where my passion has always been. Grateful for your patience & soft guidance which freed me from perfection. Grateful that this group was diverse and encouraging and sharing themselves. Goal #3 Not be imtimidated by those further ahead of me. Someone told me I needed to paint, paint, paint. This week gave me the opportuniy to realize the benefit. Working 5 days a week , and being tired at night, had prevented me from experiencing this. month for art date. I'm thinking I need to start another art group - gather friends that paint. included my 2 favorite worlds. Also, I haven't studied under one person and I want this opportunity. Just a note to say how much fun I had at the workshop! thoughtful directions you sent me in. What a fabulous workshop! I look forward to continuing contacts with the foggy 14. Thank You for a most wonderful adventure. I hope to paint with you again. instruction and time to practice what I learned. honest and completely devoted to the art of painting. hrs. than I did in an 8 week course I'd just finished! look forward to doing more in the future. a saturday to paint outside. and quickly brush in the essence of the island. weekly painting when I can. Your personal attention to each of us was inspirational. J- I took some photos of exhibit. Will send. Enjoyed working with you. From: Ron Rudat Attleboro , Ma. It was a great workshop!! You were a super leader (and excellent critiques)... The group was lots of fun!!! I'd like to do it again, if possible . I've worked on some of my sketches to make a finished painting. Thank you for your brochure for the St.
Lucia workshop & I plan to go. new ideas and ways of addressing my art and themes. Jacqueline Baldini runs a gentle workshop where all are welcomed. and oil--and her clear and sincere interpretations of the scenes at hand. I wouldn't hesitate to recommend a Baldini workshop.Jacq facilitates a wonderful week of art. If you ever get a chance to attend, don't hesitate. Thanks Jacq, you are the best. I had a such a wonderful weekend learning to use acrylics for Plein Air painting. freedom of the outdoor landscape. Thank you so much for the beautiful weekend of painting. and attending another of your workshops.